What is the perfect party game? For me, the perfect party game is one where lots of people can play and where it’s very interactive. I love games that have teams (to add a nice competitive spirit) and also can get people talking, laughing, and having fun. The new and refreshed Scrabble Catch Phrase is just that kind of game. Not Your Every Day Scrabble. Not Your Every Day Catch Phrase. One of the great things about Scrabble Catch Phrase is that it requires you to think, but you don’t have to think too hard. The general idea is that you break into two teams. (Lots of people can play – check. Competitive spirit – check.) One team holds the game unit and starts the timer. A phrase will pop onto the screen and you have to get your teammates to guess the phrase without actually saying the words. 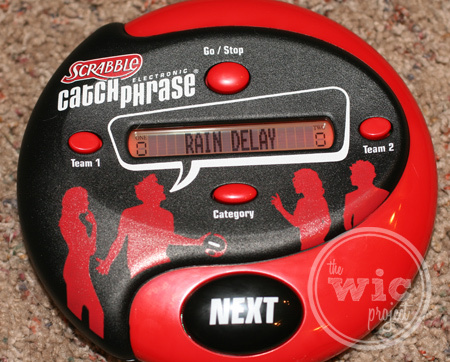 For example, your phrase might be “Rain Delay” but you can’t say the words “Rain” or “Delay”, so you could say “What it’s called when a baseball game gets postponed because there’s water coming from the sky.” And before you try it, you aren’t allowed to say a word that rhymes with the word, give the first letter of the word, or say part of the word. How would you describe this phrase? Once your team guesses the phrase, you pass the unit to the other team and they have to guess the next phrase. Teams pass the unit back and forth until time is up, at which time the team that isn’t holding the unit wins a point. The first team to 7 points wins. For hours of fun and “homemade” entertainment that is perfect for your next family game night or for your next house party, check out the new Scrabble Catch Phrase! You can find this exciting game at a store near you, or you can buy Scrabble Catch Phrase online from Amazon for just $19.99. 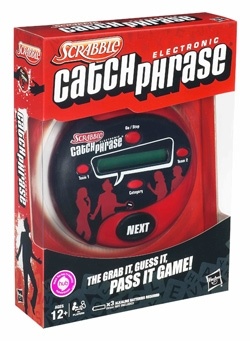 The game that keeps everyone on their toes and saying the most hilarious things is back with SCRABBLE CATCH PHRASE! You won’t want to put down the SCRABBLE CATCH PHRASE game as players frantically try to get their teammates to guess each phrase. It’s a frenzied game of grabbing, guessing and passing – just don’t be caught holding the game unit when the buzzer sounds! One winner will receive a copy of the new Scrabble Catch Phrase! Great game for lots of fun on cold winter nights . 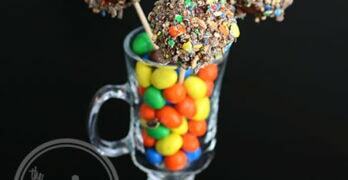 Something that a 13 , 10, and 13 year year old would like and an adult can (at least) tolerate! I look for an easy game with no complicated rules, that moves very fast. I like one that is fun and challenging. It’s also great when a group of people can play it at the same time. I look for a fast paced game that you can make people laugh with! I always look for a game that is easy to learn and does not have a lot of directions. That’s important when you have a lot of slightly inebriated people who want to play! I look for great entertainment and good time. Something that everyone can enjoy! i look for something that every age can play! Something that makes us laugh. We like charades, acting, and drawing, so I look for those kind of items, and ones that accomodate a big group. Because there is always alot of us playing. We like games that everyone can play and that really gets the excitement going! I love a game that brings out candid, spontaneous answers and inspires friendly competition among the players or groups! One that a group of people can play and that is somewhat challenging. For party games I agree with you with lots of people being able to play. I like one that doesn’t have a lot of rules and most of all is FUN! I like one all ages can enjoy! 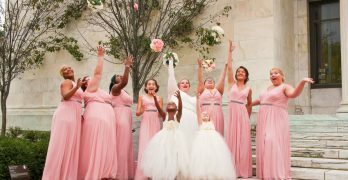 something that keeps everyones attention for as long as possible! I look for one where lots of people can play and one that creates lots of laughs. I look for a game that has simple rules, can involve several people and doesn’t take a long time to play. I like something that gets people talking. I look for something that everyone can participate in. Like charades, pictionary and other group games. I look for something that’s easy and will make us laugh. a game that makes people laugh. I look for a family friendly game. One that makes people laugh and doesn’t take too long to set up. Easy to learn. I want to play not spend all night learning the rules. I look for a game everyone will enjoy together! Something that’s Friend & Family friendly. Game night is a goos way to bring more folks together and have some fun!! !